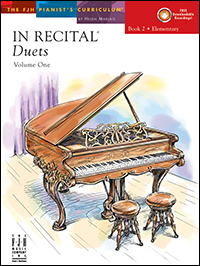 The In Recital® Duets series contains first-rate duet repertoire carefully leveled into six categories: Early Elementary, Elementary, Late Elementary, Early Intermediate, Intermediate, and Late Intermediate. There are original duets, duet arrangements of popular pieces, and duet arrangements of classical themes written as equal-part as well as unequal-part duets. Recordings are included with every book to be used as teaching, practicing, and motivational tools. This series provides practice tips, rehearsal suggestions, and duet performance strategies. Book 1 gives students a fun and manageable introduction to duet playing! Students will experience the new joy of playing with another pianist, while learning about the important aspects involved. This book uses quarter, half, dotted half, and whole notes, and most pieces call for a limited use of hands together playing. Features arrangements of Ode to Joy; Are You Sleeping? ; Take Me Out to the Ball Game; and many more, plus originals. In Book 3, students will get to experience duets written using eighth notes, five-finger patterns, cut time, patterns that extend from a five-finger position, and many more new musical concepts. This book serves as an excellent cross over to the Early Intermediate level duets. Features arrangements of Simple Gifts; Sleeping Beauty Waltz; Cielito Lindo and more, plus originals. This Early Intermediate level book utilizes dotted-quarter notes followed by eighth notes and sixteenth notes, one-octave arpeggios in one hand, and an introduction to the blues style. This book is a perfect stepping-stone to Intermediate level duet repertoire. Features arrangements of Hava Nagila; Eine Kleine Nachtmusik; St. Louis Blues; Canon in D and more, plus originals. Book 5 offers students an introduction to syncopation, Ragtime, Latin rhythms, more compound meters, and more complex sixteenth-note patterns. This book will surely showcase your duet performers! Features arrangements of Clair de Lune; Schubert's Serenade; Maple Leaf Rag and more, plus originals. In Recital® Duets, Book 6 takes every thing up a notch by adding more complicated sixteenth and triplet figures, and tackles the more advanced ensemble issues in regard to pedaling and modulation. Features arrangements of Hungarian Rhapsody No. 2; Funiculì Funiculà; Irving Berlin's - I Love a Piano; Rondo alla Turca and many more, plus originals.